Porcelain tiles are ideal for bathrooms. They are long lasting and hard wearing and come in a huge range of styles and textrures. One of my tilers has just completed a wetroom using the new Stratum tiles from Topps Tiles. The effect created by these textured porcelain tiles is stunning. They come in a large format – 300 X 600mm but give the look of a stone mosaic. You do need an experienced tiler to install these and even then it can be tricky. The greatest challenge is the grouting – because of the surface of the tile. The tiles are so rough the grout gets stuck on the face of the tile as you try to wash it off. In the end we had to use a grout remover on the tiles to get them clean. I would suggest using a pointing/grouting gun on these and minimising excess grout as much as possible. Then go over it dry and remove excess before washing the joints carefully with a damp sponge. Porcelain is the strongest and most durable tile type available. 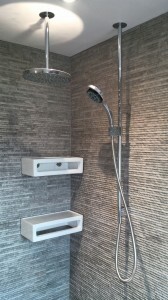 It’s availibility in so many different formats and finishes make it ideal for a bathroom project. The tile patterns and textures can so closely mimic stone it is sometimes impossible to tell the difference. You will notice the time saved on cleaning and maintaining them though. Porcelain tiles are so durable you will find that they need no maintenance and will last forever. Natural stone by comparrison needs resealing regularly and can easily become marked or stained.